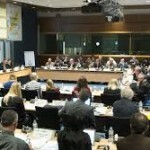 The first EU Conference on Sports Agents organised by the European Commission took place in Brussels on 9-10 November 2011. The Conference focused on the evaluation of the current situation concerning the activities of sports agents in the main team sports in Europe. Furthermore, the intention of the Conference was to build upon the results of the independent study on sports agents carried out by EOSE in conjunction with KEA and CDES on behalf of the Commission. The participants took part in several panel discussions on the issues at stake. The discussions confirmed that all stakeholders identified the need to create a better regulatory regime. Stakeholders agreed that solutions should be based on an inclusive dialogue among all relevant stakeholders. In addition, participants concluded that a self-regulatory approach by the sports movement was the most appropriate way forward, with the potential of EU action remaining possible if self-regulation fails to deliver the expected results. Moreover a ‘standardisation’ of agents’ activities through a CEN-led process (European Standardization Organisation) and social dialogue on professional football was retained as the most effective frameworks for further work. The Conference Report and selected presentations are available here.